Tom P: Deadly Class is without a doubt my favourite comic book currently being published. Its mix of teen angst and trainee assassins has me completely intoxicated. Everything about it is just grade A. The last issue left me speechless and I've been waiting like an impatient child for the next instalment. Nothing beats the joy and build up of serialised entertainment! 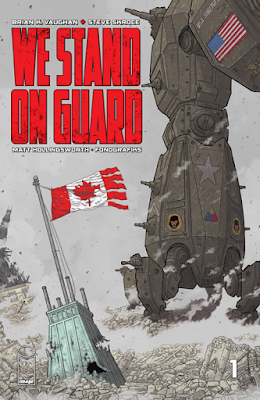 Also out this week is We Stand On Guard #1 from Saga writer Brian K. Vaughan. The fact he teaming up with The Matrix storyboard artist Steve Skroce has me stupidly excited. The Matrix is number one on my 'Greatest Movies Ever Made' list and BKV doesn't seem capable of writing a bad comic, so this should be a slice of awesome (plus it's 40 pages for $2.99!) Fancy some vampires in the great Space Race between America and the Soviet Union? Well then, American Vampire: Second Cycle #8 will be right up your street! I certainly can't resist that set up but I've been following this book from the beginning and am still happy to see it remain a strong fixture on my pull-list after all the years. I can't wait to see what happens next in Secret Wars with #4. I really can't predict it - literally anything could happen and Hickman seems to be having a blast with it. That just leaves the Supreme: Blue Rose trade collecting the first seven issues for (in British money!) just £10.99! That's twenty quids worth of comics - bargain! I tend to read Ellis in trade now as, despite being one of the greatest writers ever, I like him to have a few issues behind him before I commit (I have many unfinished Ellis comics in my possession). I look forward to seeing what he's come up with this time. Stewart R: Just like Tom I'm looking forward to both Deadly Class and We Stand Guard this week; Remender is on a creator-owned roll - and in the face of the very recent reveal about him stepping away from Marvel long may that last! - and as Tom said, Brian K. Vaughan rarely writes a comic that nudges under the bar labelled 'good' these days. Outside of these two picks from the pair of us, I have to say that it's looking like a very strong week indeed for BOOM! Studios. I'm already heavily invested in the war-torn action that Ed Brisson and Damian Couceiro have thrown our way and in Cluster #5 I'm assuming that we'll get further insight into Samara's tragic past and the circumstances that led her to serve a militaristic prison sentence. Broken World #2 on the other hand is a complete mystery to me following a strong debut that really sold me the dummy come the final page. It was a neat twist indeed and so now we just have to see if Frank J. Barbiere and Christopher Peterson can form this into a captivating miniseries. This just leaves me rounding out the BOOM! trilogy for my week with the brand new title on the block in the shape of The Spire #1 from Simon Spurrier and Jeff Stokely. These guys worked together tremendously well for Six-Gun Gorilla and now they'll turn their hands to a post-apocalyptic, fantasy murder-mystery tale. Spurrier's always a writer who produces work I'll take a look at, though perhaps my early, over-eager enthusiasm for his writing has waned a little in recent years. He certainly has a way with dialogue and manages to find an emotional nerve in his key characters with ease, so I've fingers crossed that The Spire manages to sit up there in the quality stakes with Six-Gun Gorilla.